Hallie Simms has pinpoint accuracy and video to prove it! 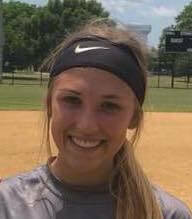 Hallie Siems is a pitcher from Stuttgart, Arkasnas with the goal to lead the state in strikeouts every year. 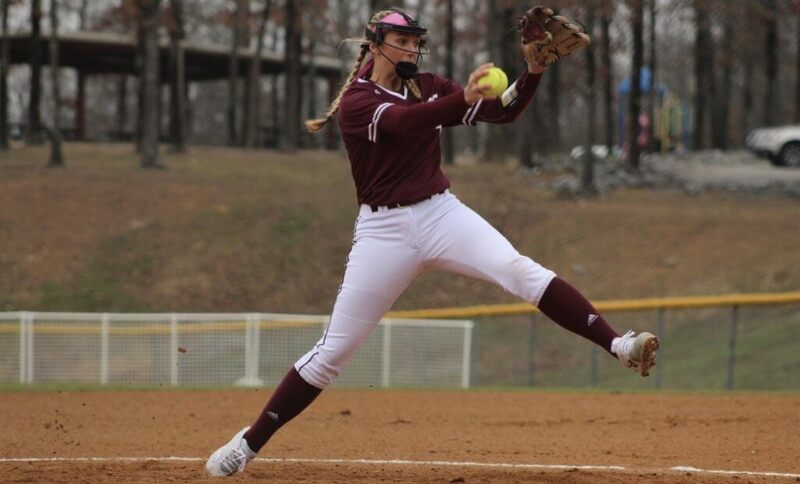 Hallie Siems is a 5-foot-8 pitcher from a small-town in Arkansas who has earned all-state honors the last two years because of her ability to hit her spots… and we have video to prove it! In a workout with her father, Clay, Hallie can be seen knocking a softball of the tee as she throws a variety of pitches and speeds. You have a video where you’re throwing to a ball on a tee and knocking it off with impressive accuracy... what’s the story behind that? My dad and I had just finished practicing and I was worn out, but dad wanted to do something “fun” for a change and wanted to see if I could stay focused. He put the tee high and inside to start out and asked me to throw a screwball (scrise), I threw about 5-10 pitches and they all missed but they got closer and closer each time. By this time, I was super frustrated, so Dad asked me to step off the rubber, take a breath, clear my mind and when I was ready, throw. I took about a two-second breath and, being stubborn, pitched the ball with all my strength with the intention of breaking the tee the ball was sitting on, but I hit the ball on the tee. Dad set the ball back up there, and I hit it again. I got comfortable with my mechanics and remembered how it felt whenever I hit the ball and I started hitting the ball more frequently. I was still pitching and missing, but about every other one or every two pitches I was hitting the spots all over the plate, high and low. 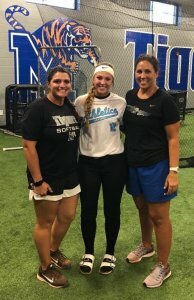 Hallie with Memphis Coach Helen Pena (left) and Head Coach Natalie Poole. Talk about the recruiting process and how that went from start to finish for you? When and how did you commit? It started out when I attended a fall camp at Memphis. The camp went well and was able to visit with Coach (Natalie) Poole and Coach (Helen) Pena afterwards. I knew then I wanted to play for them. That night I called Robby (Wilson) with NSR who was helping me with the recruiting process to see if they might have called him about me. Robby said they wanted to see my back again. That was exciting to know they were interested in me so when I went back, they took me to their inside facility where they hit and pitch. I was in one lane and another pitcher was in another lane and we were pitching to some of the Memphis players. I knew that if I was to stand a chance I had to be better than the other pitcher. After, we finished Coach Poole came to me and my dad and asked if we would stay around for a while that she wanted to talk to us. Once everybody had left we went to Coach Poole’s office with Coach Pena. They told me they liked what they saw and would like to have me back for a visit. So, a few days later mom, dad and I went to visit and tour the campus. When we finished the tour, Coach Poole and Coach Pena set us down in their office and began to tell me what they could offer and if I was interested. Right then I started crying and then we all were crying and hugging. It was a very exciting day for me. What advice would you give younger players in terms of exposure and being recruiting?